Pharmacies play a substantial role in healing America and helping us stay healthy. While it may appear that pharmacists are the stars of the pharmaceutical show at your local drug store, there are other pharmacy employees who are just as important to its staying open. These passionate individuals are pharmacy technicians. Pharmacy technicians assist pharmacists in running a pharmacy. They handle duties such as organizing and maintaining inventory, packaging and labeling prescriptions, answering phones and other acts of customer service. So what does it take to become a pharmacy technician and why is it important for pharmacies to employ good ones? Let’s start with the requirements. Many people who become pharmacy technicians do so by completing a post-secondary training program. Pharmacy technician programs are common offerings at trade schools across the country. Such programs can usually be completed in a year or less, though there are those that reward associate’s degrees that take a little longer. Following the completion of a program, up-and-coming pharmacy technicians may be required to pass a certification exam. Certification requirements vary from state to state, so be sure to read up on the ones for your state of residence. It’s technically possible to work as a pharmacy technician with a high school diploma and passing a certification exam in lieu of completing a program. However, a comprehensive trade school training program will adequately prepare you to assist pharmacists in the real world. Now that you know how to become a pharmacy technician, let’s look at why qualified pharmacy technicians are crucial to the success of pharmacies. Prescription drugs are a substantial part of the healthcare system in America. As such, it’s important that pharmacy technicians know what they are doing when it comes to handling prescription drugs. They are the ones who are responsible for answering any questions patients have when they pick up their prescriptions. The more knowledgeable and qualified pharmacy technicians are, the better care they can provide patients who fill their prescriptions at that pharmacy. Filling prescription drugs and providing the customer service that comes with working at a pharmacy is a huge responsibility and a vital aspect of the health of Americans. One of the most obvious reasons for pharmacies needing qualified pharmacy technicians is the safety of the pharmacy’s customers. Accuracy is of the utmost importance when filling and distributing prescriptions. A mistake can, in some cases, be a matter of life and death for a patient. The pharmacy would almost assuredly be facing a lawsuit in the event of such a grave mistake. Thankfully, pharmacists provide a safety net, as they have to oversee any and all prescriptions that are passed out to ensure their accuracy. With that being said, another reason it’s important for pharmacies to employ good pharmacy technicians is that they can make things easier for the pharmacists. Pharmacists have their own unique slew of responsibilities, so it helps when they can depend on their qualified pharmacy technicians to accurately fill prescriptions and perform other tasks to help the pharmacy run smoothly. 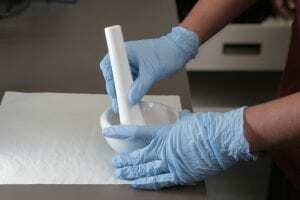 In short, good pharmacy technicians can make the distribution of prescription drugs safer. Going along with the previous two points, qualified pharmacy technicians are adept at managing inventory of the pharmacy and accurately filling patients’ prescriptions. Again, this makes life easier for pharmacists. Being able to work efficiently and keep things organized makes it possible to reduce the time that patients have to wait for their prescriptions to be filled. It can also help cut down the time they have to wait in line at the pharmacy to pick up their drugs and start healing faster. Get the picture? Qualified pharmacy technicians allow pharmacies to run more smoothly and enhance the experience customers have with and at pharmacies. If you’re passionate about helping people get better, a career as a pharmacy technician might be just what the doctor ordered. Coyne College’s Pharmacy Technician program provides students with a comprehensive education in the pharmacy technician occupation. At the completion of the program, which can be finished in as little as 42 weeks, you can feel confident and ready to start your new career as a certified pharmacy technician. Coyne College offers an array of career services and job placement help for its students, including mock interviews, externships, resume assistance and a vast alumni network that can help you land entry-level employment after completing the program.